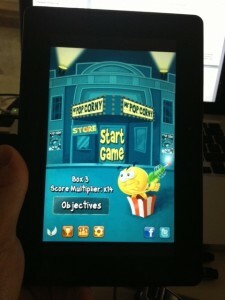 Continuing after my latest post about porting existing iOS games written in C/C++ to the Android platform, here I am again writing about my latest porting endeavor that brings Pop Corny to the third platform! 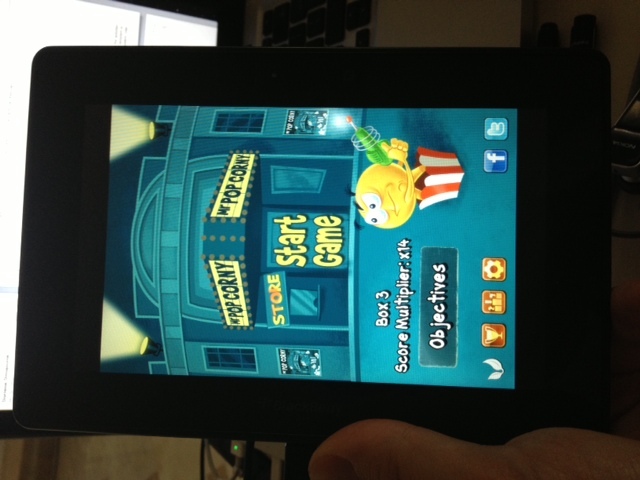 Ever thought of porting your iOS game to the Blackberry Playbook? Well, here I will share some insight of what to expect. If you are like me you will probably think that the Playbook has something to do with the tech that used to run Blackberry’s phones. This misconception was so strong in me that I didn’t even consider a port to it. The truth is however, that the Playbook is based on the new platform that Blackberry is creating based on the QNX operating system, and will also be used on the BB10 phones. Things started to look better on the porting front with these info, but there is always a fear that Blackberry could be Google and force everything to Java and only support native after a long time has passed. It turns out that things are much better than I expected. Not only Blackberry allows you to write native apps, but its Native Development Kit (NDK) is a complete solution for developing on the platform. Not like Android for example, where the NDK is just a crude exposure of the native Android’s build system, supports minimal functionality and requires Java calls for most stuff. On Playbook you can write a full native app and never look at Java again. The NDK will provide C level APIs for all that you are going to need. From screen handling and input, to in-app purchases. The Blackberry provided development environment is QNX Momentics, which is based on Eclipse, but also you can easily do everything with command line tools if you prefer. I chose to go with Momentics even though I find Eclipse slow and sluggish, because it is very nicely setup for native C/C++ development (with debuggers, profilers, etc) and I wanted to see how far it will get me until I started missing the command line. Surprisingly, it did all the way. Had no problem with it, which is a first for me and Eclipse. You also get an emulator for trying out your, code which is based on VMWare. This didn’t strike me a good thing because you have to buy VMWare to run it. Sure there is the VMWare Player version that is free, but you can use that only on Windows and Linux. The Mac users, like me, will have to use the 30-day trial of VMWare Fusion, or buy it. The last few days I am a happy owner of a BlackBerry Playbook. The device was offered to me by RIM (thanks to Luca Filigheddu) in order to port Pop Corny to it. To tell you the truth I never owned a Blackberry device before, not to mention develop for it. It was a totally new experience, where I had no idea what to expect. It been a long time since this blog was updated, I know! Well I was kind of busy lately. Looking for a job, finding a job, then doing the job and finally trying to get some free time for summer vacation and free time projects. You know that getting a new job always makes things a bit harder until you get comfortable. The good thing is that now work has stabilized and I finally start to have some free time. I’m not going to write a lot here at this time. I just wanted to let you know that I’m well and good. I’m also planing to start working on Sylphis3D again in a more committed and persistent manner. Regarding Sylphis3D I would also like to inform you that I’m working on something big! You probably know my opinion on megatexture on terrain. Well I managed to think of an algorithm to apply megatextures on any kind of geometry. Yes you heard correct! The new Sylphis3D will have totally virtual texturing. The wait is over… Sylphis3D is open source! I just release the source to Sylphis3D! Check out the story at the Developer Network. It’s been a month since the last Carnival of Game Programming and unfortunately there is not going to be a second one. The number of submitions was low and I can’t publish a carnival like that. Sylphis3D goes open source : BSD or GPL ? The under development branch of Sylphis3D is going to support high quality terrain rendering. At the moment the terrain rendering code is in place and produces some very nice views! However the sky support was limited to skybox rendering. At first I thought I would just go for some HDR textured skybox. This was good until I reallized that it would be stupid to have an engine support realtime shadowing and lighting and have the outdoor areas with static lights, because of a static skybox. It was obvious that a dynamic sky was needed, so that day/night cycles can be simulated.